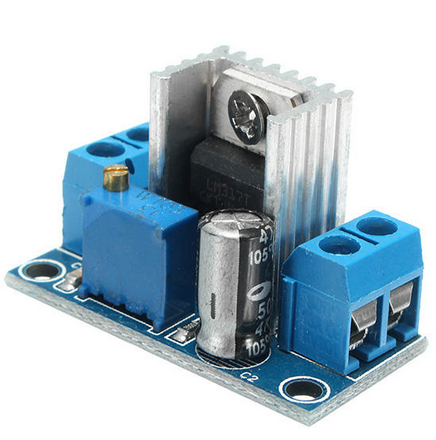 The adjustable voltage regulator LM317 can supply 1.5 A at an output voltage of 1.2 V ... 37 V.
In contrast to the fixed voltage regulators of the 78xx family, where the reference voltage U r is related to ground, U r at the LM317 to the output voltage U out . This offers the possibility, with only three connectors and set the output voltage using two resistors (see circuit below). R1 should have a value of 240 ohms. 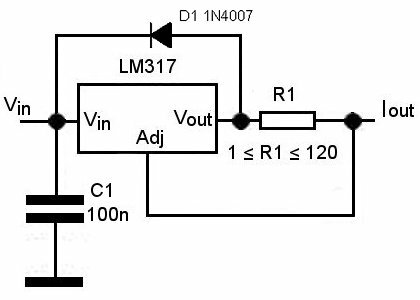 The marked diode 1N4001 protects the regulator if the The output voltage should be higher than the input voltage (for example, when switching off when the Output side "thick" cones in the circuit). The DIode can also be omitted. Only two external resistors are required to adjust the output voltage. Please select whether you want to calculate UOUT or resistor R2. Alternatively, the normally-ground reference pin of a fixed-voltage regulator can also be switched over a voltage divider "lifted" and thus also with a fixed voltage regulator different voltages than the printed ones are generated. To avoid oscillations, a capacitor can be connected parallel to R2 (also with the LM317). Please also take into account the occurring power loss (cooling) of the voltage regulator. 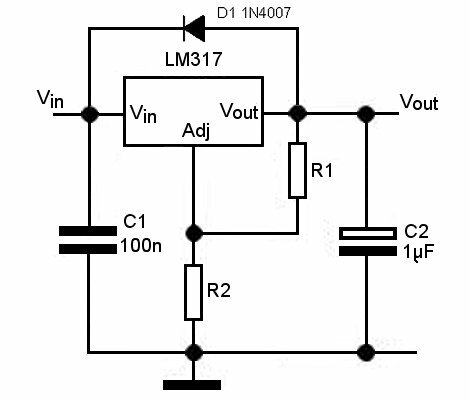 The LM317 is also suitable as a simple constant current source. The voltage regulator is adjusted so that between Adj and Vout is 1.25 volts. Therefore, I = 1.25 / R1, the maximum current can be calculated. The output current can be between 0.01 and 1.25 amperes (R1 between 1 and 120 ohms). Please select whether you want to calculate R1 or the output current. Attention: The LM317 is available with different pin layouts! So please check the datasheet! The LM350 can be used for higher currents up to 3 A.